Uncategories Fishermen on Senkaku Islands: Why Do Japanese Have To Withdraw From Japanese Territory? September 11 marked the 5th anniversary of the nationalization of the Senkaku Islands (part of Ishigaki City, Okinawa Prefecture) that had previously been privately owned. Since then, China Coast Guard ships sailing through the waters around the islands have become the norm, and China has boasted that it has broken de facto Japanese control of the islands. In addition, the ships entering the waters around the islands have increased their military capability, and there have been repeated incursions. In February 2016, in response to the incursions, the Japan Coast Guard set up the Senkaku Security Unit. However, confrontations between the safety agency and Chinese ships are continuing, and even now local fishermen cannot approach the fertile fishing grounds surrounding the islands. Although the islands and waters around Senkaku are Japanese territory, the incursions have prevented the Japanese from exploiting the resources. “How long is this situation going to continue,” the fishermen and residents of Ishigaki ask. Five years ago, when the huge number of Chinese Coast Guard ships first appeared, the command of the Japan Coast Guard expressed readiness to provide security for the islands. At that time, China was strengthening its de facto control over the South China Sea, and it was anticipated that they would try to do the same with the Senkaku Islands. From early on the Japan Coast Guard modeled the creation of a special security unit for the islands and worked steadily to respond. Moreover, in addition to the continual procession of Chinese government ships, the frequency of provocative acts has increased. About two years ago, the Chinese dispatched government ships armed with machines guns. Their oceanographic research vessels have been conducting surveys repeatedly without permission. According to the Japan Coast Guard, a total of 643 Chinese government ships have made incursions into the waters around the Senkaku Islands since these were nationalized in September of 2012. In this context, it cannot be said that the security provisions of the Japan Coast Guard are fully adequate, and there is a need for support above and beyond the special unit for the Senkaku Islands. Fishermen in Ishigaki can only sigh over the ongoing situation that shows no sign of resolution. “We certainly do not want the situation where we cannot work to continue indefinitely,” said Yasumasa Higa, 60, former head of the Okinawa Prefecture Association of Fishermen. The area around the Senkaku Islands is a singularly good fishing ground because the Japan Current (Kuroshio) brings plankton that serves as food and makes the waters a gathering place for high value fish, such as hamadai (etelis). The waters are also known as a spawning ground for blue fin tuna. Unfortunately, after the nationalization of the area, not just Chinese government vessels but Chinese fishing boats have pushed into the waters around the Senkaku Islands. Japanese fishermen have had to contend with 3,000-ton-class Chinese ships that pursue the much smaller Japanese fishing boats, and with Chinese fishing boats that cut Japanese nets. To avoid trouble, the Japanese fishermen have been forced to move to other areas to fish. Adding to the conflict over possession of the Senkaku Islands is the Japan-Taiwan Fisheries Agreement concluded in April 2013. 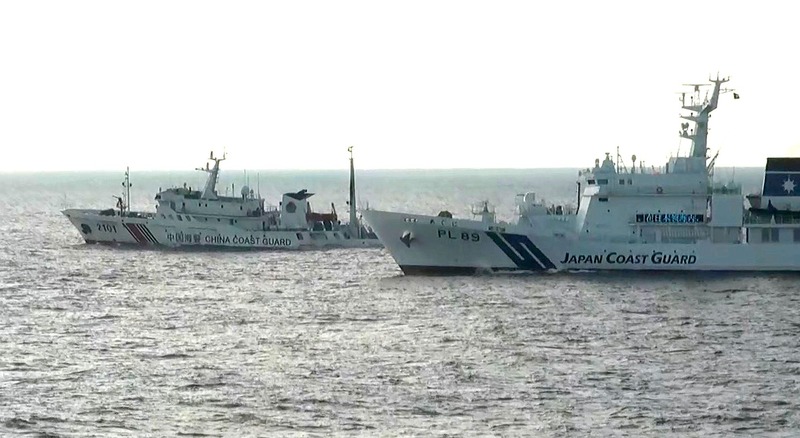 This was intended to check Chinese-Taiwan joint fishing operations by recognizing the right of Taiwanese fishing boats to operate in the waters around the Senkaku Islands but Chinese-Taiwanese fishing vessels have taken advantage of the latitude in the agreement. “We had to withdraw in the face of an onslaught of Chinese-Taiwanese fishing boats. While the Senkaku Islands are and have been Japanese territory, why is it that we are the ones who have to exercise self-restraint and withdraw?” Higa lamented. At the same time, Japan has not stationed government officials on the islands, and has not engaged in the construction of berths for ships. It has followed a foreign policy of avoiding actions that provoke China. However, if the situation continues to worsen, there is concern that Japanese control of the Senkaku Islands will be further weakened. At the end of July, Study Times, the house organ of the Central Party School that trains the Chinese Communist Party cadres, published an article celebrating the accomplishments of Xi Jingping, president of China and the Chinese Communist Party. President Xi Jingping has stated his intent to make China “a powerful maritime nation.” Through the dispatch of ever more heavily-armed patrol vessels, it appears that he will be increasing the pressure on Japan. On Uotsurishima, the shrubs that cover the island are withering due to foraging by goats. Nakama plans to put forward a resolution at the regular municipal assembly session scheduled for September, asking for a ground survey. “Nationalization in and of itself was a good idea but it’s about time for development to begin. It’s necessary to break out of this situation where even the local residents can not get close to the islands,” he said. The islands are approximately 440 kilometers from the main island of Okinawa and 330 kilometers from the Chinese mainland. The group includes Uotsurishima, Kitakojima, Minamikojima, Kubashima, and Taishoto. The surrounding territorial waters and connected area are similar in shape to the island of Shikoku and about the same area. The islands became a Japanese possession in 1895. On September 11, 2012, in order to provide for their stable management, the Japanese government nationalized three islands: Uotsurishima, Kitakojima, and Minamikojima. In 1971, China began asserting that the islands were Chinese territory.